This date is June 9, 2015 at 13:00-14:00 local time. Opengear introduces their Resilience Gateway product to the Tech Field Day delegates attending Cisco Live US 2015. Opengear demonstrates their Resilience Gateway product to the Tech Field Day delegates attending Cisco Live US 2015. 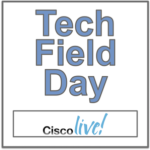 The Tech Field Day delegates get their Opengear Resilience Gateway questions answered at Cisco Live US 2015.